Full disclosure: This is a review of the SnapRays Guidelight. I purchased this product myself and I am not being compensated in any way for providing this review. However, I am a participant in the affiliate program for SnapPower and if you purchase a product from their website after clicking one of the links on this page, I will receive a commission. Despite the monetary incentive, I strive to provide you with an unbiased review of this product. Nightlights are useful things, but a traditional nightlight has a few disadvantages. It has to be plugged in, and therefore you lose the use of an outlet, and if you need the outlet for something else, the light must be removed. Many traditional nightlights tend to be somewhat bulky making them prone to damage. The SnapRays Guidelight by SnapPower solves those problems. The SnapRays Guidelight is available in Duplex or Decor style and is designed to replace a standard cover plate. It features two prongs that contact the terminal screws of the electric receptacle, providing power for three built-in LED lights. A light sensor turns the LEDs on in the dark and off in the light. The company claims the lights will last 25 years and only cost about a dime per year to operate. SnapRays Guidelight in action in our bedroom. Image is an affiliate link. Same dimensions and profile as standard plate covers. Very inconspicuous when LEDs are off. The quality of light is good. Light shines in the direction of the ground prong, typically down. No hard wiring necessary. Very fast installation. There are similar products on the market that must be hard wired. Convenient. 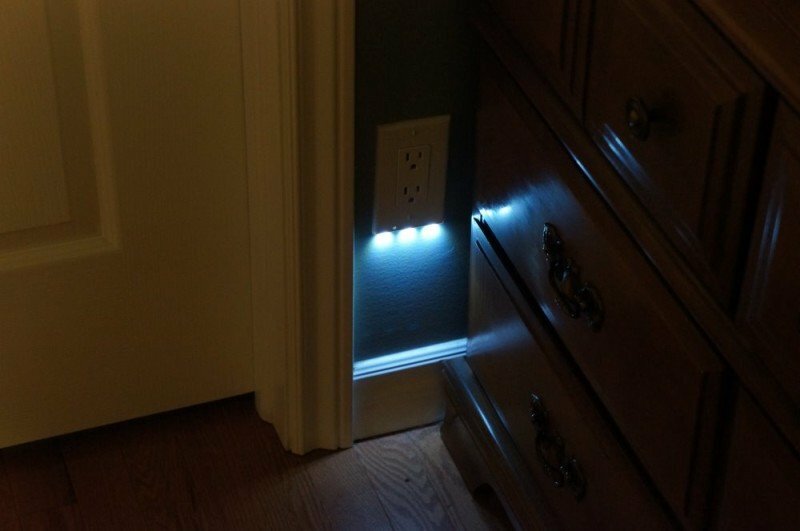 No need to plug in or unplug a nightlight. Not prone to damage like traditional nightlights. LEDs are very bright. I installed one of the Guidelights in the bedroom, but later uninstalled it because it was in the line of sight from the bed if sleeping on stomach or side. SWMBO complained that the light was keeping her awake. Not compatible with switches or GFCI outlets. This limits the usefulness somewhat. We cannot use the Guidelights in our bathroom, for example. Competing hard wired products do not have those limitations. There is no way to disable the light. There may be times that the nightlight is not wanted and it would be nice if there was a small switch to turn it off. 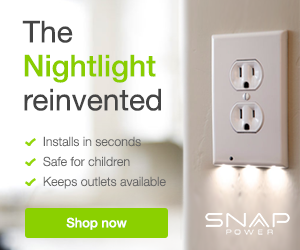 While installation is fast and easy, the Guidelight is not portable like a standard plug-in nightlight. The power prongs can be a little fussy to coax into the device box due to their design. I received my Guidelights 10 days after placing my order. The order was placed on Sunday and shipped on Monday. This was an international order, shipping from Utah to Ontario, Canada. Also just curious do you know how much it would cost to send back the 3 Duplex Guidelights? I’ve tried finding a way to give return labels to our Canadian customers but USPS and Canada Post have been very unhelpful in that area. So depending on how much it is, we would maybe ask you to send them back, then we would refund the cost from your original order. I sent back the erroneous order at my own expense but have not pursued a refund. Considering I allowed almost 6 months to pass, I am willing to eat that cost. The folks at SnapPower already went above and beyond. Thanks for reaching out to us, we will totally replace the ones that we sent you with the correct style that you ordered. It doesn’t matter to us that it was 6 months ago, you should get what you originally ordered. All in all, despite the original error, customer service was excellent. Admittedly, a nightlight isn’t much to get excited about. But in terms of design and execution and form and function, it’s hard to top the SnapPower Guidelight. It’s simple, discreet and unobtrusive, looking no different than any other wall plate. And the automatic night light just works as long as you don’t mind the fact that there is no way to shut it off manually. Time will tell if the longevity claims are accurate, but whenever the LEDs do reach the end of their useful life, the Guidelight can be replaced in seconds, by either another Guidelight or a standard wall plate.